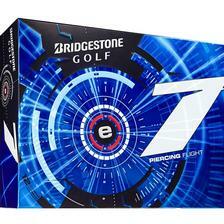 Bridgestone Golf e7 Golf Balls - One Dozen - White - $22.99 - GolfersEdgeOnline.com - Best Golf Equipment On The Web! Faster and longer shots are the name of the game. When misses left or right are not an issue, play the e7 for maximum speed and distance. If you have any more questions about the Bridgestone Golf e7 Golf Balls - One Dozen - White; do not see the model you are looking for; need custom options; or prefer to not purchase online, then please call us at (630) 656-1291.